With Kate Moross and Carri Mundane. Celebrating the art of self-expression and 23 years of the iconic Dunk basketball sneaker, Nike Dunk XXIII: Be True brought together 23 of London's most original street culture creatives. The inspired exhibition took place throughout April on east London's Brick Lane. The collection of 23 life size photographic portraits taken by Neil Bedford, curated and styled by Carri Mundane, and touched by the Midas illustrative typography of Kate Moross (not to mention the accompanying documentary by Jason Jules and Amazing Grace) made for a stunning showcase of London's creative forces. The role call of invited individuals spanned notable DJs, designers, skateboarders, artists and collectors - James Lavelle, Afrikan Boy, Fats Shariff and son Che, Zezi and Kesh, Daisuke Sakaguchi, Charlie Crockett, JME and my mans Mubi and Kish. Dazed sat down with Carri and Kate for pizza and chats. 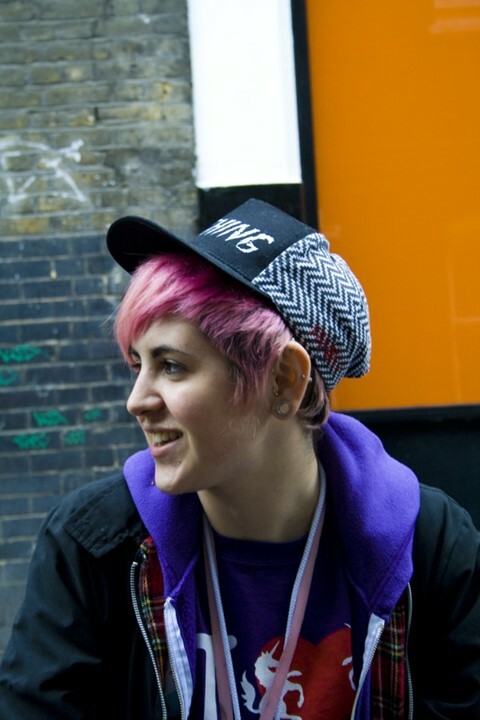 Kate Moross: The brief was how basketball culture ties into London street style and all the creatives who have evolved out of that culture. I really connected with a lot of the interviews because I'm a huge Nike fan yet before this I'd never really looked into that culture with such a fine-toothed comb. I really like how much people think about their aesthetic. I think it's totally important that you represent yourself in everyway. Carri Mundane: The key points were colour, individuality and being true to your school, being true to yourself. The Dunk is so connected to basketball culture, but not as much here in the UK, here there's stronger links to skateboard culture and that's something I wanted to bring into it. It's about people who can bring their own personality into it. KM: It was clear that everyone felt incredibly comfortable in the photo shoots, nothing was forced. CM: Neil is really amazing to work with and a great photographer. He doesn't come with an ego. It was a very collaborative project. KM: There were so many people involved and we were all so in each other's pockets for an intense time, but it all felt really natural. It was art directed by all of us together. CM: Everyone who was picked, obviously they all look amazing and there's a link to the Dunk, but everyone is individually pushing forward their own scenes, doing their own thing, whether it's music or fashion. KM: And they had to articulate that. CM: It was so nice to work with Kate, another girl, especially on a project like this with Nike, basketball culture and trainers. There was a lot of testosterone flying about. We had to bring it down! There's a mix of different generations involved. I was really excited about having James Lavelle a part of this. He was a big inspiration for me when I was younger and a huge part of my personal story, having him there representing alongside the younger guys like Afrikan Boy and Tempa T. In anything that I do, it's really important to reach a lot of people. KM: Yeah, definitely, it's accessible. It's showcasing creative people and done in a very free way, the beauty of freedom. CM: It's about art and being British. I wanted to show how we do it here! It's not an imitation of US street culture. We are totally different and that's really important to me.With Kate Moross and Carri Mundane.